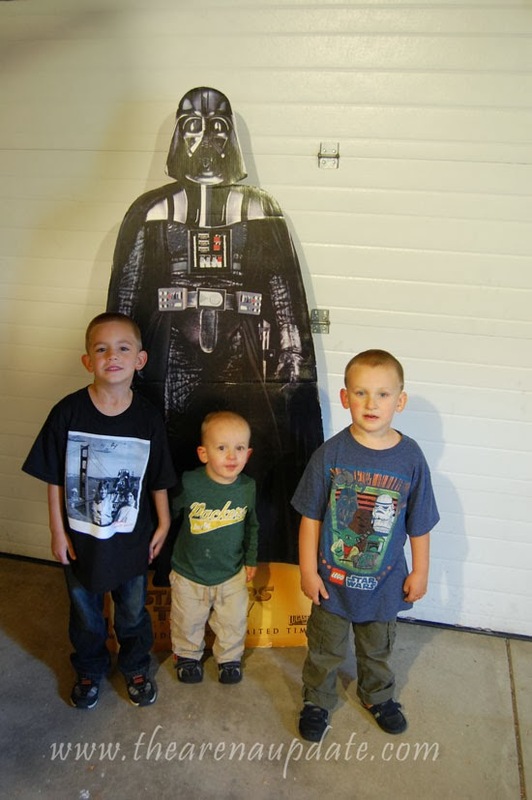 My kids love Star Wars. 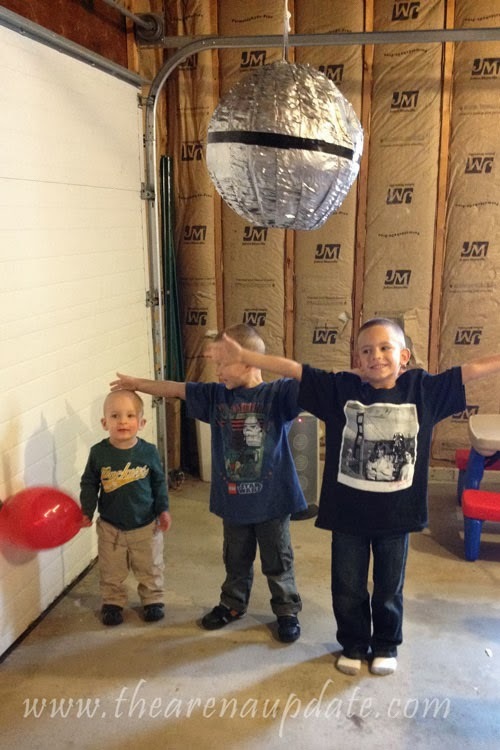 As a parent who was born in the 80s, I love that my kids love Star Wars. 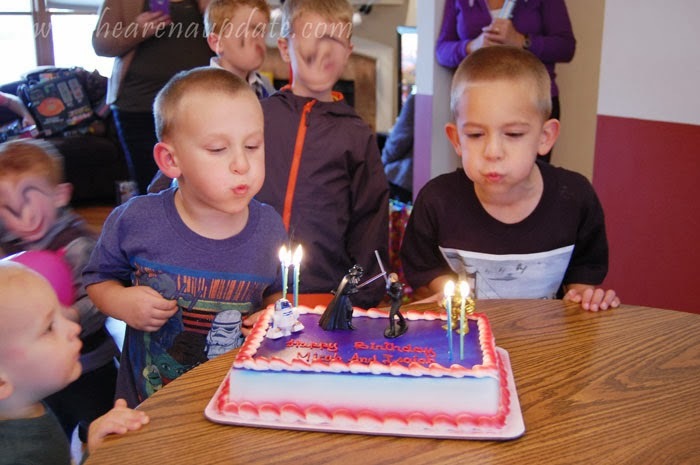 I firmly believe that God gave me three sons so I could referee light saber fights, use "the force" as a way to explain how wind works, and settle arguments based on who can most accurately reenact the scene I've affectionately nicknamed "Luke's Paternity Test." 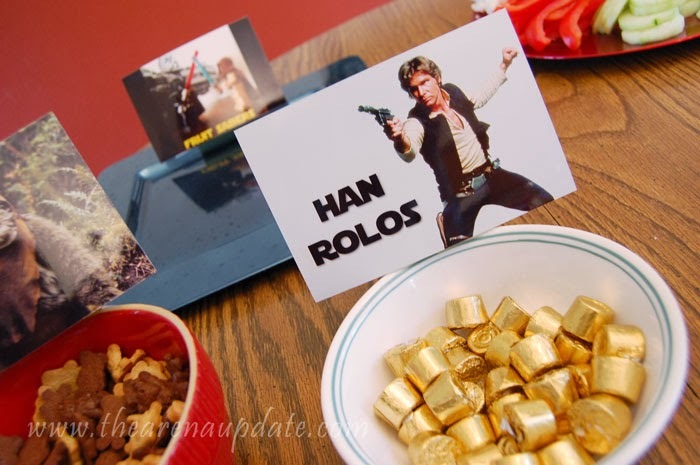 When it comes to Star Wars, we have a couple house rules. 1. Episodes IV - VI will always be known as "the first ones" because they were released first and are exceedingly superior movies. The same truth does not apply to the additional band scene added in Jabba's palace. Ugh, I fast forward every time. 2. The "high ground" rationale for Obi-Wan's victory in Episode III is complete B.S. Watch the battle with Darth Maul at the end of Episode I for my proof. 3. Episode II is practically worthless. 4. Darth Vader is one of the coolest villains in the history of cinema. Period. 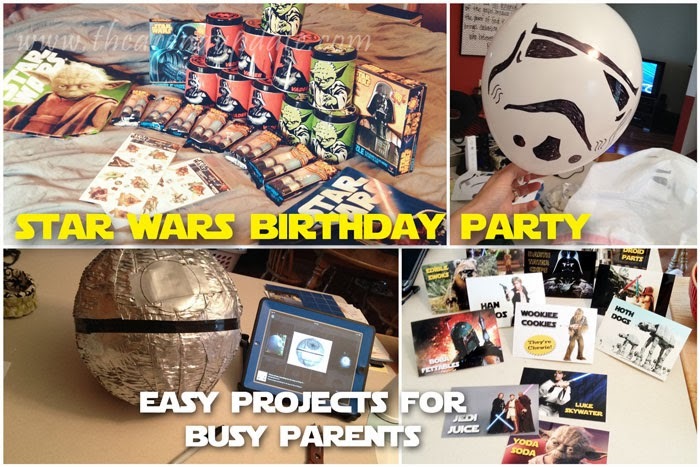 When my oldest two boys jumped on board for having a double birthday party with a Star Wars theme, I was probably nearly as stoked as they were. Ok, maybe even a little more. I scrolled through Pinterest and got some ideas, but I knew my time and budget were limited so I needed to make it easy and low-stress, but still wicked cool. Do not be intimidated. 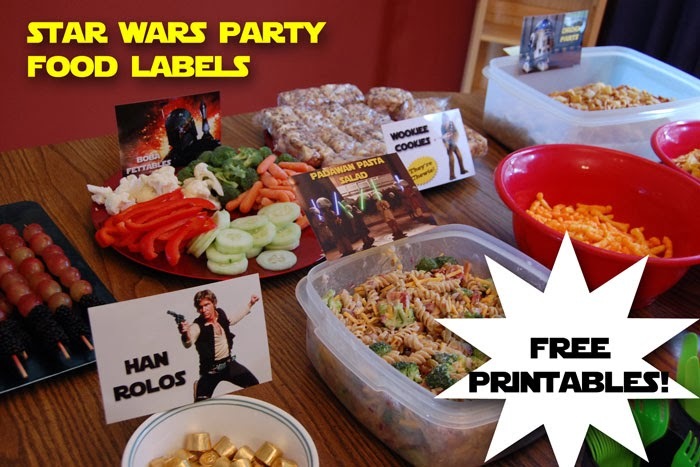 This party was super easy to throw together and I've made it even easier for you to borrow my ideas by giving you FREE PRINTABLES to use at your own party! Woot woot!! 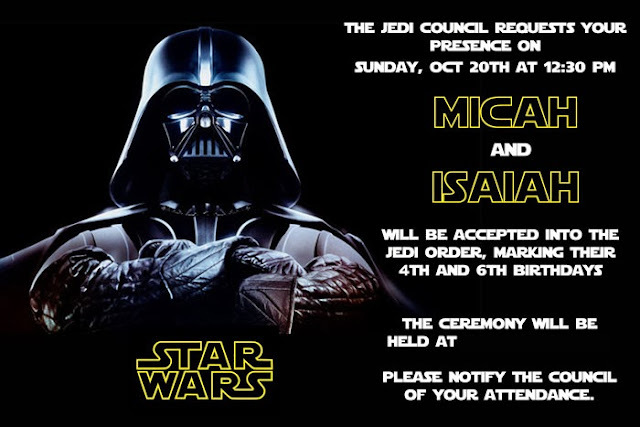 Let's start with the invitation. I whipped this baby up in Photoshop Elements and then just emailed it as an attachment to our family and friends. I didn't even take the time to print 'em and mail 'em because.....well, I'm cheap. I love how it turned out and it was actually really easy. My husband was quick to point out that Darth Vader would have had NOTHING to do with inducting new Jedis into the order, but I didn't care. He looked too B.A. not to use. Feel free to download this invite and use for your own party! 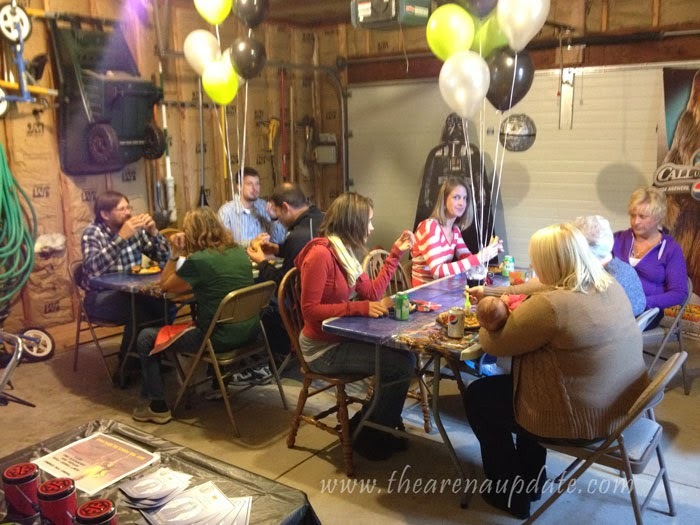 It's a PSD file, so you will be able to edit it with Photoshop, Photoshop Elements, or you can use Paint.net to edit the layers to suit your party's needs. After the invites had been sent and the RSVPs collected, I got to work on the really fun stuff. I knew I wanted to label the food in a fun way, so I spent a couple hours on the computer one night while catching up on my DVR and I whipped up these labels. 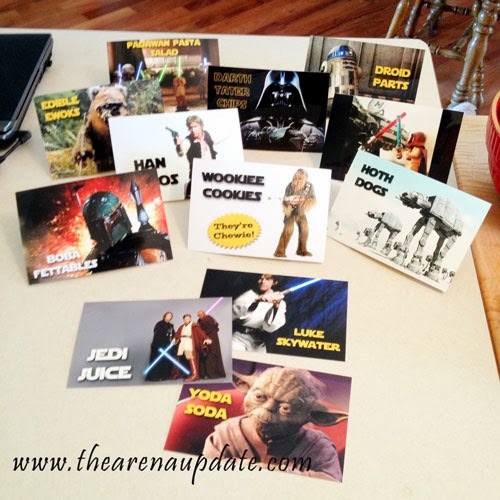 I made them each the size of a 4x6 photo and then just had them printed at the local Walgreens. I used some index cards and tape to attach them to their respective food items and voila! 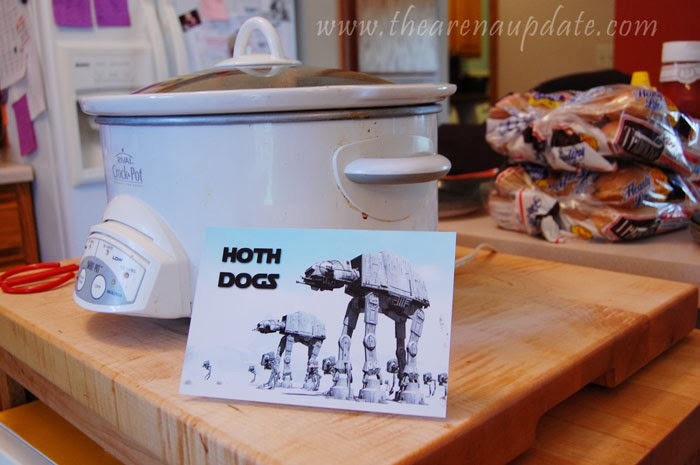 I was especially proud of the "Hoth Dogs." It tickled me every time I saw it. Please excuse my disgusting Crock Pot. I did warn you that this was a party of "minimal effort!" 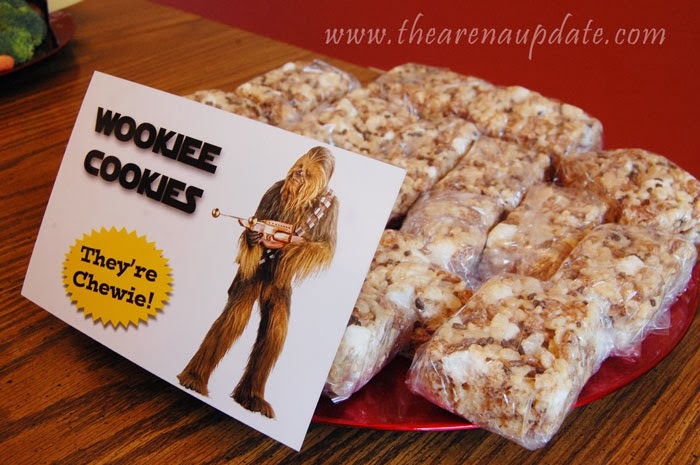 The "Wookiee Cookies" were a huge hit!!! All I did was whip up a batch of Rice Krispie Treats using two parts regular cereal and one part Cocoa Krispies. I also stirred in some mini marshmallows and added some chocolate sprinkles to the top for added interest. Once they were cool, I cut them up and wrapped them individually in plastic wrap before assembling on the serving plate. These were easily the Home Run in the food department. 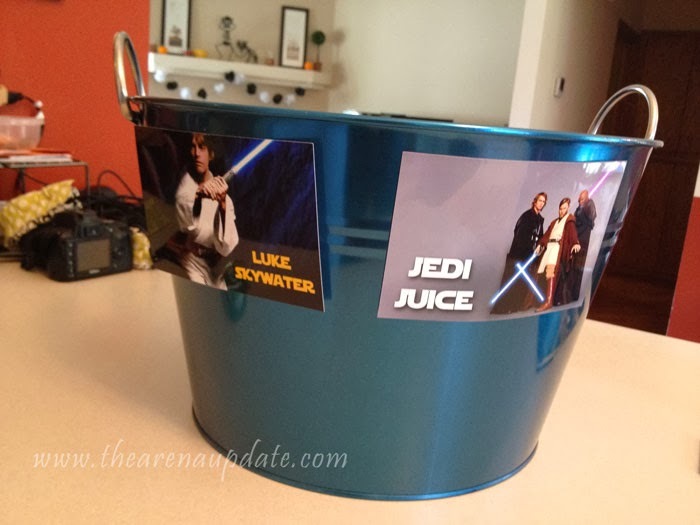 I put bottled water and juice boxes in this beverage bucket and dumped some ice on top. Easy peasy. Another mega-success came in the form of these "Fruit Sabers." I made the card and asked my sister-in-law to bring the fruit. My instructions to her went something like this: "Just stick whatever fruit you want on some skewers and call it good." She took that ball and ran with it in a big way. 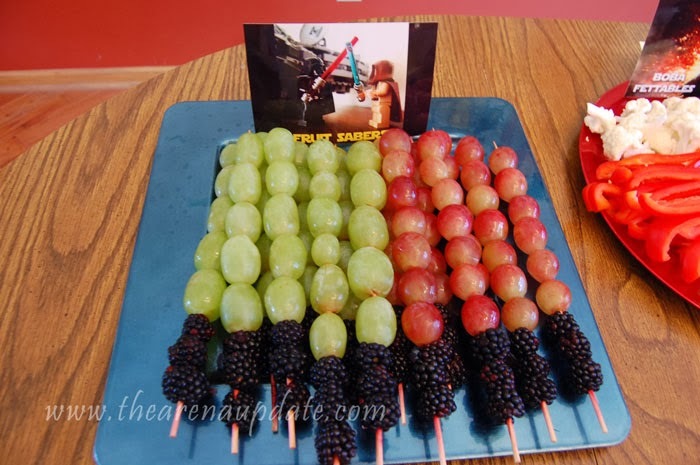 I love how she thought to put the blackberries at the base to make it look like the hilt of a lightsaber. Genius. If you'd like to download the food labels as .jpg files, CLICK HERE! Please enjoy and share! The last order of business in the food department was the cake. I have no talent in this department, so I ordered the cake from a local grocery store. Darth Vader and Luke Skywalker came as part of the cake, but I stole R2D2 and C3PO from my kids' toy collection and stuck them on the cake for extra interest. 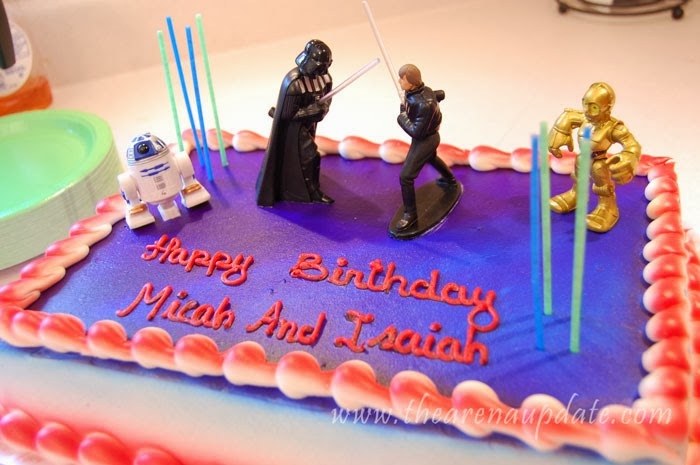 The boys LOVED their cake and the toys that came with it are now fully integrated into our horde of Star Wars toys. I found every single thing you see above, except for the temporary tattoos, in the dollar spot at Target. 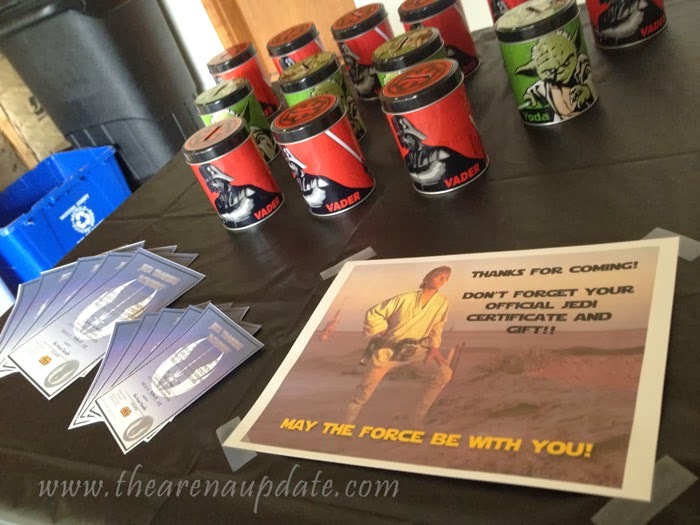 The tin banks were perfect for fitting a lightsaber candy, a tattoo, plus a couple more pieces of candy I stole from the bags intended for the trick-or-treaters. 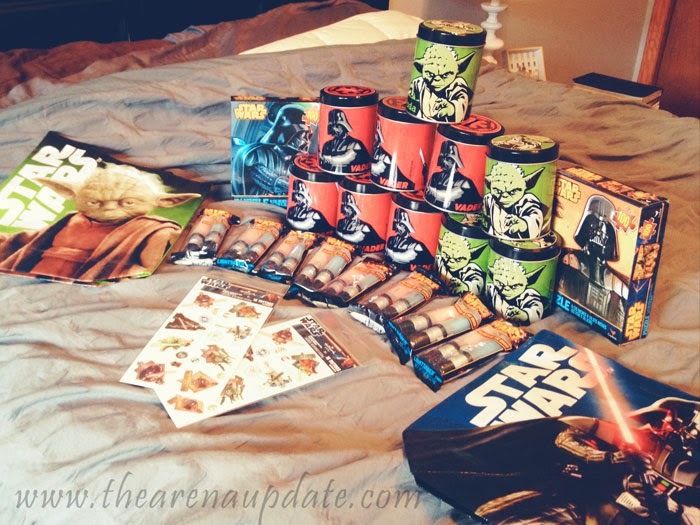 The large tote bags and puzzles were gifts for my young Jedis. I set up the favors on a card table out in the garage and whipped up this little sign to stick next to them. The kids loved it! As for games, I kept it very simple. 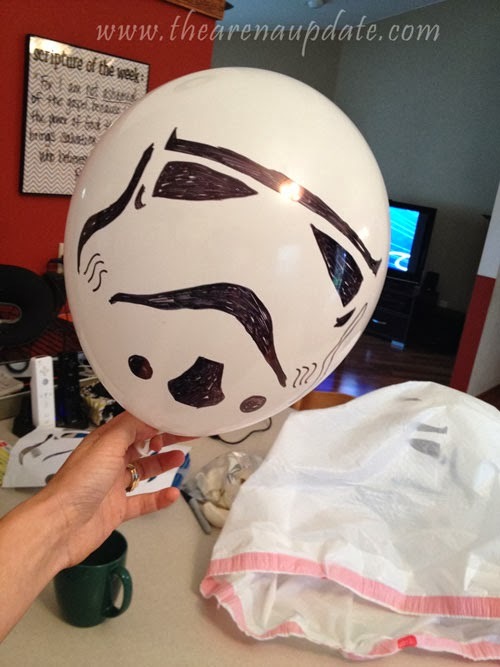 I blew up about 8 white balloons and used a pumpkin carving template I found online to draw on Stormtrooper faces with a Sharpie. 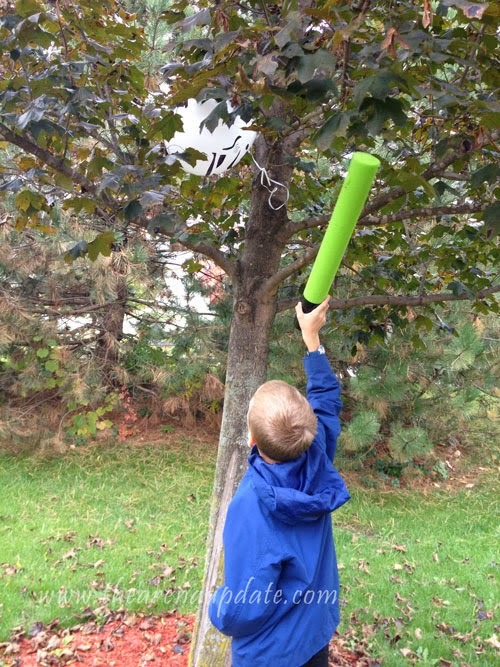 I tied some ribbon to each balloon and put them in the trees in our backyard. 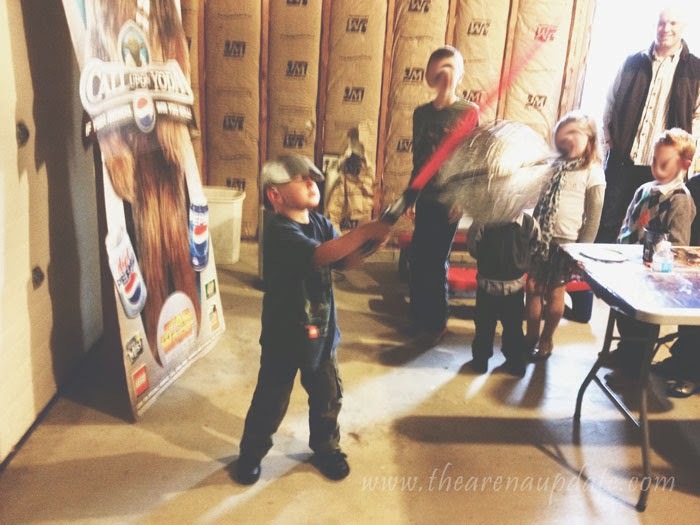 After turning several Dollar Store pool noodles into light sabers with duct tape, I set the kids loose to go attack the Stormtroopers! Once the Imperial army was taken care of, they seamlessly transitioned into beating the heck out of one another so my plan worked flawlessly. 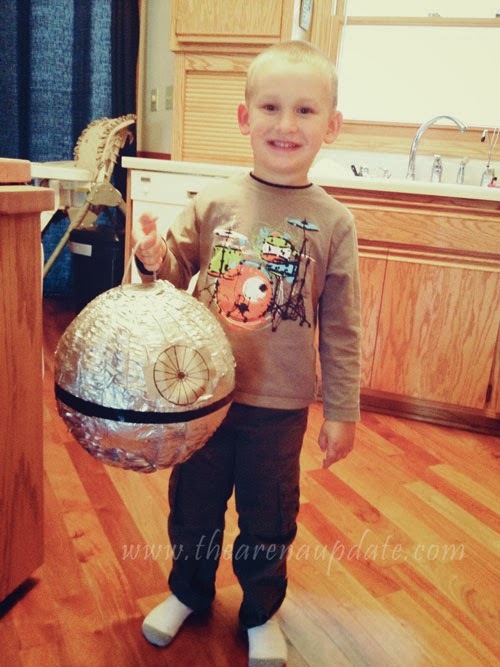 The star of the show was the Death Star pinata! 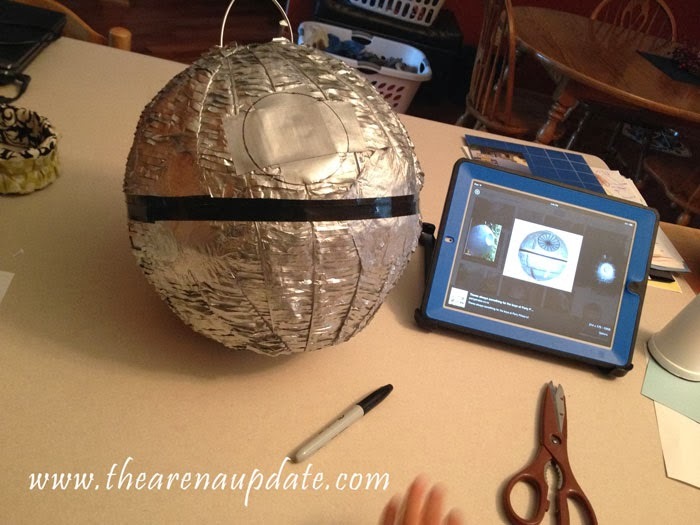 I bought a soccer ball pinata from Party City and used some metallic silver spray paint to make it look more Death Star-ish. Before spray painting, I filled the pinata with the goodies and then covered up the hole with a few strips of duck tape. Once it was painted, this created the perfect smooth surface for drawing on the trademark weapons system. As for the strip around the middle, good ole' duck tape to the rescue! I also spray painted a helmet I got at the Dollar Store to create a blast shield like Luke uses in Episode IV when training with the remote. It was perfect in place of a blindfold for hitting the pinata! Of course we used a light saber to whack at it. As it turns out, Party City makes a very sturdy pinata. 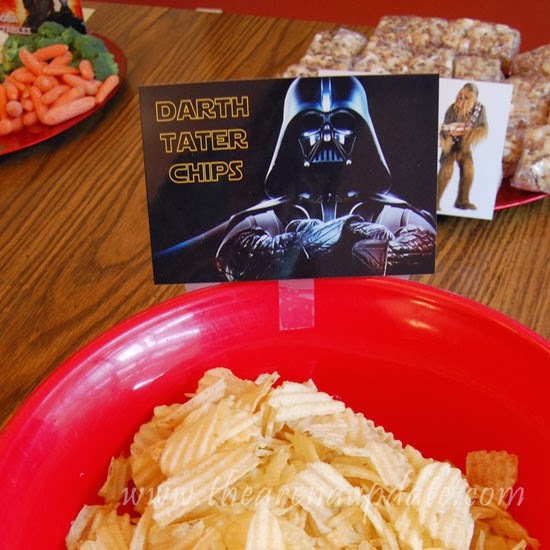 My young Jedis had a blast at this party and I found myself calmly sipping a cup of coffee while I waited for the guests to arrive because everything was so low-stress. Hopefully you found some of these ideas helpful!